December 18th, 2015. This month's issue of V Jump magazine contains several new pieces of information about the upcoming D-3 Ver. 15th Digivice, which will go up for preorder on the Premium Bandai web shop in less than seven days' time. 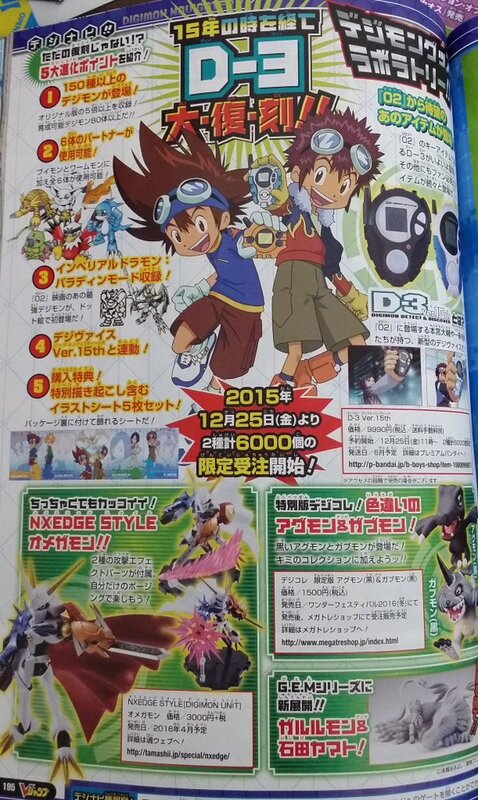 According to V Jump, the D-3 will contain more than 150 Digimon, over 80 of which can be trained by the player. Tamers will not be locked to just V-mon and Wormmon; they will have their choice out of six Digimon partners, including Armadimon, Tailmon, Patamon, and Hawkmon. 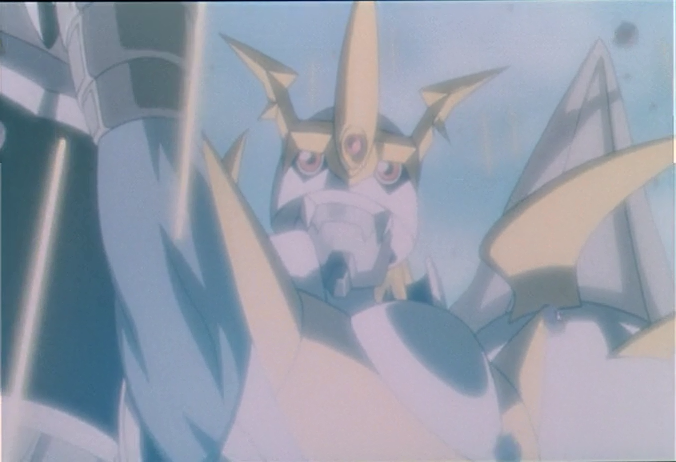 For the first time ever, the D-3 will include Imperialdramon Paladin Mode from Diablomon's Counterattack, who was previously only available on the D-Arc Digivice. Moreover, the D-3 Ver. 15th will be able to connect and battle with original Digivice Ver. 15ths, maintaining connectivity between last year's and this year's models. Those that purchase the new D-3s will also receive a set of 5 illustrations featuring Yagami Taichi, Ishida Yamato, Motomiya Daisuke, and Ichijouji Ken. Only six thousand D-3s will be produced in total between the black and blue D-3s, each of which will be priced at 9990 yen (approx. $81 at present exchange rates) and the devices will ship in June 2016. Although not overtly stated, the presence of four additional Digimon lines suggests that there will not be any additional versions of the D-3 Ver. 15th, as there were for the Digivice Ver. 15th. The original D-3 released in 2000 had just two base Digimon per device, but with thirteen evolutions for each Digimon. The magazine also makes mention of the Omegamon NXEDGE Style figure launching this April, and of MegaHouse's upcoming G.E.M. Series Ishida Yamato & Garurumon figure.